Global Angels prides itself in helping whole communities living in poverty, and providing long term solutions. It’s always so encouraging to hear back from our partner projects and learn about the positive changes taking place, all made possible through public and corporate donations. In this particular village in Uganda, goat and pig-breeding programs are well underway, and the transformative impact on the families lives is immense. Just to tell one inspiring success story…..there is one family who owns a goat and are now able to send their child to school. Last year they had received a pig that had piglets, which in turn helped them to buy a goat. Now they actually breed goats, and the increased manure from the goats has helped create a much better quality maize harvest on the family’s plot of land. The on-going breeding of the pigs has also helped fund the much needed school fees for their older brothers and sisters. On selling one goat, this then helps to buy chickens and potatoes, which were also replanted. You get the picture! Through Global Angels, it only costs £25 to buy one goat for a family in Uganda, a tangible resource that gives so much hope. As you can see, this brings security to families who are fortunate enough to own one. Thanks to all of the support they have up until now, these programs are now self-sufficient. At the end of our school term last Friday, they had a surplus of about 500 kilograms of maize in the food store. In short, they did not buy maize (the main ingredient for ‘posho’, which is eaten at lunch). “This is a great mark in the project’s life!”, says Project Manager and Co-Founder, David Bakeine, who thanks all those involved in helping to develop the production farm. This demonstrates how education for children goes hand in hand with a families self-sufficiency. Here, some children are now able to enrol for another year at school, where they are able to learn and create friendships just like any other student in the world. 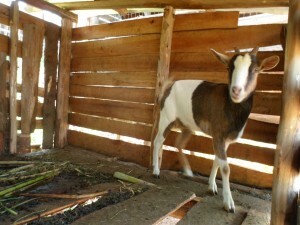 Step up…..buy a goat today and help a family in Uganda!